This Sunday my local park was bustling with people playing sports, walking the dogs, hanging with their offspring, and of course, taking time to indulge in a little picnic. Whether you partner up with your significant other or bring along a slew of pals, dressing for the occasion is half the fun. Keep it cool and casual in comfy flats, a basic T-shirt and long denim shorts (more comfy to sit in, plus they won’t pick up grass stains). Accessorize with colorful shades that protect your eyes, a chic headband to hold your hair back in the wind and a scarf/shawl to act as extra warmth in case the sun ducks behind the trees. Remember that the Shopstyle Set the Trend Contest is almost over. 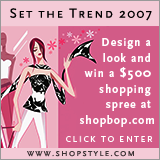 There’s less than 10 days to get your winning look into your stylebook so you can have a chance to win a $500 shopping spree at shopbop.com.